Intex has expanded its product portfolio in the country with the launch of a new smartphone. Dubbed Aqua Selfie, the handset is priced at Rs 6,649, and comes in Rose Gold and Black colour options. In terms of specifications, Intex Aqua Selfie features a 5.5-inch HD IPS display. Running Android 7.0 Nougat operating system out-of-the-box, the smartphone is powered by a 1.3GHz quad-core processor, paired with 2GB of RAM and 16GB of internal storage. There’s also support for microSD cards of up to 64GB in size. For imaging duties, the Aqua Selfie has an 8MP rear camera and a 5MP front-facing shooter, each with an LED flash. The smartphone packs a 3,000mAh battery and offers 4G VoLTE, Bluetooth, Wi-Fi and GPS as connectivity options. Like other Intex smartphones, this one also comes preloaded with apps like QR Code reader, Gaana, Xender and others. Last month, Intex launched its Aqua S3 smartphone at Rs 5,777. The smartphone comes with a 5-inch HD display of 720×1280 pixel resolution. Running Android 7.0 Nougat operating system, it is powered by 1.3GHz quad-core Spreadtrum SC9832A processor. There’s 2GB of RAM and 16GB of internal storage, with support for microSD cards of up to 64GB in size. 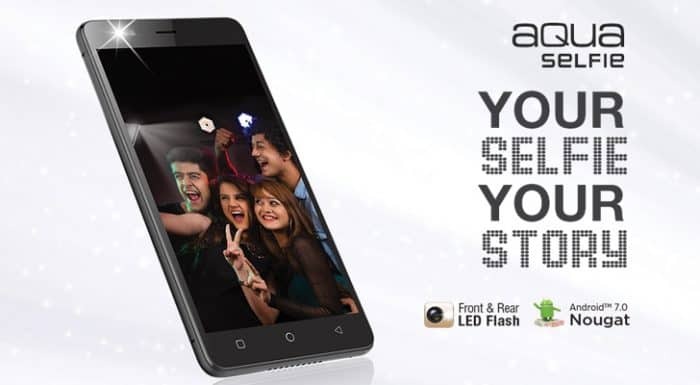 The dual-SIM Aqua S3 sports an 8MP rear camera with LED flash, as well as a 5MP front-facing shooter for selfies. It’s backed by a 2,450mAh battery, and comes with QR Code scanner and miFon security (a 9-in-1 security suite that also has lost phone tracker, Gaana and Vistoso apps). For connectivity, the smartphone offers 4G VoLTE, Wi-Fi, Bluetooth and GPS. Intex Introduces Aqua Selfie Smartphone 0 out of 5 based on 0 ratings. 0 user reviews.